Rather than strike out on its own, Arizona will join a lawsuit filed by 15 other states against the federal government over the landmark health care bill passed by Congress. Gov. 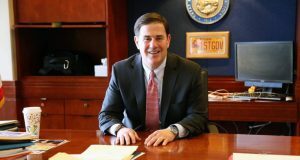 Jan Brewer had said Arizona may file an individual suit over the Patient Protection and Affordable Care Act, but on April 6 the governor announced that Arizona would join the preexisting lawsuit filed in March after the bill was passed. Joseph Kanefield, Brewer’s general counsel, will represent the state in the suit. The state estimates the cost to be no more than $5,000 to join the suit. Brewer has expressed concern over a provision in the health care bill that requires states to maintain their Medicaid programs at their current levels. That law prohibits Arizona from moving forward with plans to cut about 310,000 people from the Arizona Health Care Cost Containment System, leaving a $385 million hole in Arizona’s 2011 budget. The state must also now restore KidsCare, which provides health care for about 38,000 children, at a cost of about $20 million. Why waste more money and time and participate in what legal experts have determined to be a losing cause? The federal government has the power and authority to impose taxes,laws, the draft, penalties, etc.- it has been proven time and time again. The Arizona Governor should forget about chasing these rainbows and create a revenue driven balanced budget instead of attempting to cut health care benefits to the needy. The federal government only has rights outlined in the constitution, anything else falls to the states. Thank God our state has decided to protect our God Given rights outlined in the Constitution. Its incredibly sad that some people in our country have embraced this Communist ideology. That statement is incorrect. “anything else falls to the states and/or the citizens.” would make it correct. But it’s still a waste of taxpayer money to pursue a lawsuit that even laymen can see is a lost cause. And if we are going on constitutionality the citizens of every state should get together and sue the federal government and every state for every unconstitutional law on the books. Health care is needed, period. Health care is needed yea … within reason. 3 Trillion dollars falls way outside the bounds of reason. But we already have a health care system. Best one in the world! Why do you think the Prime Minister of Italy flys to America to have surgery? Don’t you guys know the health care bill is NOT about health care? the government system. Obama is evil and he has to be defeated! Obama is very vulnerable right now. Only 15 states had enough balls and integrity to file lawsuits!??? system. Heck, the cat is already out of the bag! Health care bill is about control! If you want to win a war then you have to have strength in numbers mainly from the most powerful people. The people I’m talking about here are the governors of the states. We need a FULL ON RESISTANCE! The resistance has already begun with these 15 states filing lawsuits. 35 more need to hop on board! NOW! Then the conservatives will take the congress back in 2010 later this year in November. I am so pround of Gov Brewer, she has the guts to make the tough decisions to protect our state. The 37% of liberals may not like it but the 64% of regular Americans love her for it! Thanks Jan!